The bike locker program is unknown by the general student public, even though it’s fairly inexpensive. So hundreds of bikes end up parking outside of a secure, locked facility, only holding one or two bikes. Bike theft in general is a problem throughout Eugene, Springfield and surrounding area. Implement new methods; not just increase awareness about bike registration, proper lock usage and the locker program. 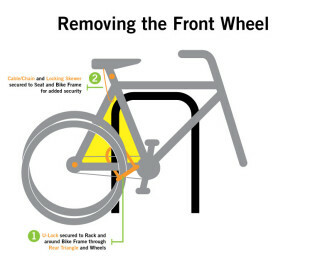 Students should be able to have a low-impact way to protect their bike, and belongings on their bike without having to park across campus, lock all parts of their bike up, and buy expensive security devices or spend valuable time on removing everything from their bike. I want to find a place where students can feel comfortable storing their bikes, with all of their gear, without fear of opportunistic thieves. I want to work with a team that will help me brainstorm new, innovative ideas to stop bike theft and ways that the UofO can help implement a system that will be low cost to them. This project will include multiple funding sources so we can go to the UofO with our plan and matching contributions to make it a reality. Fall term goals are to finalize the procedure, make a deal with UofO administrators and work to secure funding. Winter term will be used to implement this new procedure or program. Click here to take the UofO Better Bike Safety survey! Source: Eugene, OR Police Department, Bicycle Safety and Prevention.